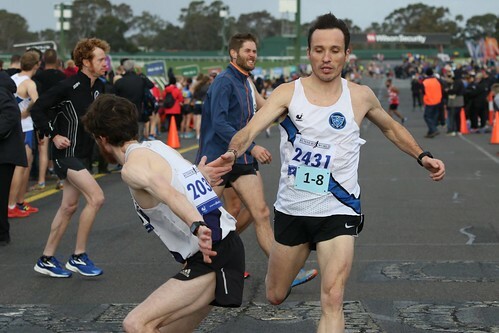 A truncated Sandown Road Relays on Saturday still delivered thrills for MUAC with our Premier Women winning silver and our Premier Men bronze. Race officials concerned about forecasts for hail, high winds and purple rain reduced all relay legs to a single lap of the Sandown Racecourse. Panglossian spectators and curmudgeons bemoaned the decision but the outcome was fast, exciting racing. The Premier Women were contention all race and a storming final leg from Katrina Anderson got them within one second of victory, hindered only by an ill timed cheer of support that tipped off the final Knox runner. There was no risky business for the Premier Men, with solid running by all six runners finding the team in the lead for the first four legs of the race. Medal presentations saw an outbreak of the ode to joy by the MUAC faithful as the two teams collected their hardware. 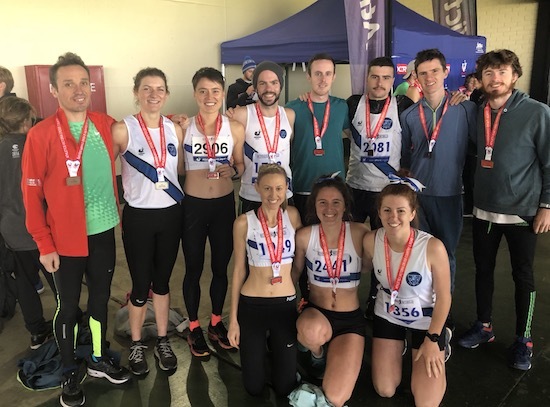 The race marks the first time in several years that both MUAC teams have been on the podium in the top division, a notable achievement in the strongest winter athletics competition in Australia, and moves the Premier Women into fourth place, the same position as the Premier Men. Team selectors put returning middle distance gun, and MUAC 1500m record holder Isaac Hockey into Division 2 reasoning that it was better the devil you know, and Hockey lead the team to a comprehensive victory, more than a minute clear of second place. In contrast, Division 3 Men met their waterloo, finding themselves one runner short, one of the few lowlights of the day for the MUAC contingent. The Division 5 Men took another step towards promotion, collecting second place. The team has now built an 8 point buffer on third place. Our Division 3 Women, also in search of promotion, took more points off their rivals and are moving closer to the top two spots on the ladder and the promotion zone. Misfortune befell the Division 5 Women with Johanna Bayer stymied by the vagaries of Melbourne public transport and trapped outside the racecourse. Top runs of the day came from Cassidy Shaw (8:45) and Lucy Buckley (10:29). A big thank you to Tim, Pippa and Ally who filled our volunteer spots today. Division 5 Women, 6th, incomplete. 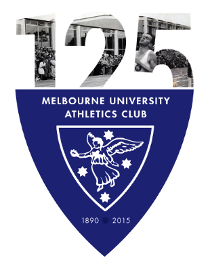 Division 3 Men, 13th, invitation. MUAC will be back in action for Round 6 of XCR’18 on Sunday 22nd of July at the Lakeside 10.